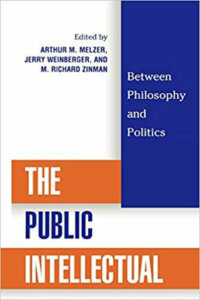 This volume examines the role of the public intellectual in the West, striking a middle ground between those who view intellectuals as prophets who would lead us to the promise land if only we were to listen to them and those who see intellectuals as detached from the common sense of life and being on the wrong side of history. The contributors to this book address the question what are the defining features of a public intellectual and when did they first arise and why? Are they a good thing for society and intellectual life? And are they disappearing now or have transformed themselves into something else. The first five chapters review the history of the public intellectual. In “What is an Intellectual?” Arthur Melzer begins by stating that the defining feature of the public intellectual is a tension between theory and practice, contemplation and action. The public intellectual is a knower of ideas and partakes in the public sphere. Melzer distinguishes between those political philosophers of classical Greek with the modern public intellectuals who subscribe to the power of reason and a progressive account of history. For Melzer, the question confronting the modern intellectual is what provides him or her standards in a regime governed by public opinion and a progressive view of history? Cut off from such ideas, Melzer suggests, is to commit a type of public suicide. Thomas Pangle in the second chapter examines Socrates as the citizen philosopher as the closest analog to a public intellectual. But these citizen philosophers do not propose a program of civic reform but ways to moderate the ambition and partisan strife of political life. It is only when philosophers no longer concern themselves with theological questions do they become public intellectuals. But this transformation comes at the cost of devaluing philosophy and the contemplative life for a practical and public one. In chapter three, Paul Rahe looks at the eighteenth-century Enlightenment where the public intellectual emerges on the stage with the hope that the “party of reason” will come into its own. But the dangers of doctrinarism and rationalism, the neglect of political prudence, and revolutionary fervor also became apparent, which Burke, Hume, and Tocqueville warn against. The desire to make politics into an exact science can unleash horrific political acts where every phenomenon must conform to what is predictable. Rousseau is examined in the next chapter by Chris Kelly. Rousseau was a thinker who was engaged in the exploration of the tensions and changes of the public intellectual. Rousseau’s quarrels with Voltaire, Diderot, and other philosophes reveal the challenges that confront public intellectuals in taking a public stand and the importance of personal dignity. Rousseau rejects the view that intellectuals can form a party whose private interest is identical to the public interest; instead, people should pay attention only to the solitary intellectual who ignores both party and his or her own interest. While not public intellectuals, the American Founders played a public role as philosophical aristocrats. Gordon Woods shows in “Founding Fathers and the Creation of Public Opinion” how they created a modern democracy in which people like themselves could not long endure and had to be replaced by public intellectuals. The emergence of public opinion creates a new egalitarian society where outstanding members are ignored or submerged in what the vox popouli wants. The next four chapters focus on the present state of public intellectuals. John Patrick Diggins trace the history of intellectuals from the American Founders to the present. If intellect and power were fused in seventeenth and eighteenth-centuries America, then the public intellectual became alienated from society in the nineteenth with the rise of evangelicalism, transcendentalism, and Jackonianism. The twentieth century saw the rise of the activist public intellectual in progressive and Marxist politics, only for some of them to turn to the right (i.e., neo-conservatives) after the radicalization of the left in the 1960s. In “The Decline of the Public Intellectual and the Rise of the Pundit,” Josef Joffe analyze the present state of public intellectuals in America. Those who traditionally were public intellectuals have retreated to the universities with its academic specialization and the predominance of relativism. Replacing them is the new class of punditry and research institutes (e.g., Brookings, American Enterprise Institute). With this change, Joffe suggests, American public discourse and politics has become impoverished when compared to the past. The next three chapters turn to Europe. Pierre Hassner in his chapter examines the “totalitarian temptation” of European public intellectuals towards communism and fascism in the twentieth century. Tony Judt looks Raymond Aron whose support of classical liberal politics, Algerian independence, and his opposition to communism and the 1968 student revolts made him an isolated public figure, although his positions eventually turned out to be true. Adam Michnik reminds us of the heroic role that Eastern European public intellectuals played in their struggle against communism and warns about the dangers they pose in times of peace. The final three chapters examine the how public intellectuals actually practice their roles in society. In his chapter, Ira Katznelson’s discusses how Karl Mannheim, Robert K. Merton, and C. Wright Mills practiced an engaged social science. Martha Nussbaum shows how contemporary philosophy possesses a vital role in the alleviation of human suffering, particularly in the empowerment of women in the West and elsewhere. Finally, Saul Bellow concludes the volume with the comic side of the public intellectual, seeing that so many modern artists and intellectuals have become comic writers and comic figures because they live in the world of ideas while history, politics, and life continues without them. The Public Intellectual is an excellent contribution of essays by some of the best minds in academia that addresses the questions what is a public intellectual, from where do they come, and what is their purpose for today and tomorrow. Each chapter is consistently excellent and insightful, illuminating the nature and character of the public intellectual in the West. By doing so, the book explores the broader and enduring questions about the relationship between thought and action and ideas and events.